This Christmas, become the big red jolly man when you put on the Mens Old Time Santa Suit. This Santa get-up will be a huge hit with the grandkids, and has everything you need to look and feel like good ol' Saint Nick. Pick up a Santa bag from our site, and fit everyone's presents and toys in it! When you show up to the family party in this Santa costume, everyone is going to love you. 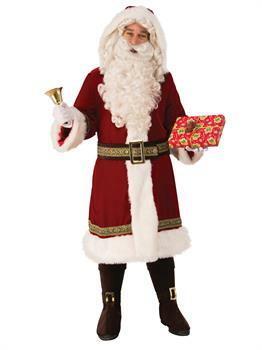 Buy your Mens Old Time Santa Suit today, and make this Christmas your best yet!